“BACK UP YOUR DATA!” That’s a simple message expressed in capitalised, red and glittery letters on The Archive Team website introduction illustrating just how important it is that we take notice because, when it comes to our personal digital histories, we rarely do. There are 1.11 billion active Facebook users in the world and I’ll bet most of them don’t think to back up their messages, photos, video and wall posts documenting a present that will one day become a priceless past. Flickr, Dropbox and The Cloud are handy tools for accessing information no matter where you are but that accessibility hinges on the assumption that these services will be in operation forever. They won’t be. Contrary to popular belief, the internet actually does forget, especially when the information no longer serves a purpose in the interests of the businesses that host it. Yahoo!’s unprecedented dumping of GeoCities in 2006 has become a foreboding example of the risks involved in putting your faith in the corporate conscience because there isn’t one. Once an emblem of online trash, now viewed as a fascinating insight into the user behaviours and DIY aesthetics that inform a fast expanding Net art field to this day, the destruction of the GeoCities empire has been described as an “internet atrocity”. The notoriously behind-the-times legal system has done nothing to safeguard our cyberfuture from similar catastrophes and, understandably, the fate of recent Yahoo! acquisition Tumblr has people apprehensive. The Web 2.0 bubble is yet to burst but when it does there’s no telling what will happen to the sites its users unconsciously depend on for uninsured data storage. 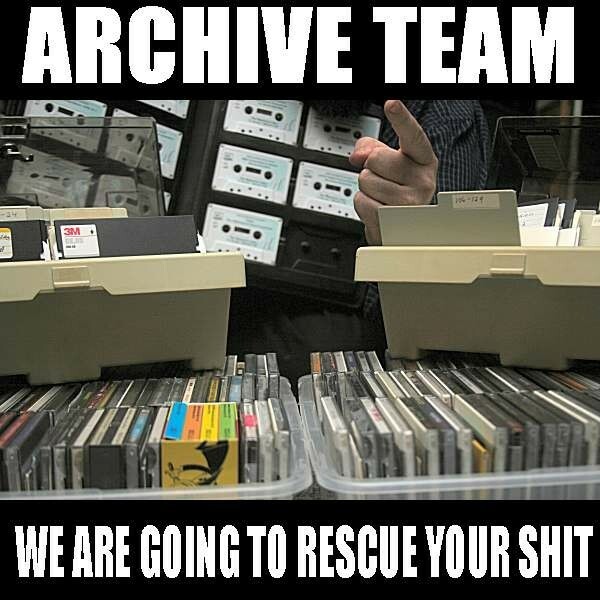 That’s why The Archive Team founder, Jason Scott, has set up what he calls “a loose collective of rogue archivists, programmers, writers and loudmouths dedicated to saving our digital heritage”, because if we won’t help ourselves, they will. Comprising so-called “ArchiveTeam Warriors” working under names and aliases like “emijrp”, “seanp2k” and “Ross”, members are dedicated to monitoring and archiving hosted sites before it's too late. If not for them, internet obscurities like FanFiction, the digitised comic book archives of ElfQuest and Russian-based cyberpunk resource The Cyberpunk Project, running since 1994, risk disappearing completely, while more mainstream examples of user-generated content that are either dead or on death row include blogging platform Posterous, MobileMe and Friendster. Responsible for salvaging what they could from the wreckage of GeoCities, The Archive Team are probably one of the better known digital archiving tribes but there are more data hoarders to speak of, including WebCite , UK Web Archive and Internet Archive. But The Archive Team, at least, is trying to promote individual user agency by providing detailed instructions on how to back up your own information. The Web is still a digital frontierland, functioning on a laissez-faire market economy where there is no obligation on the side of service providers to its users. In an exchange between these online tenants and their landlords, offering a service in return for valuable data and dynamic content, with no protection from eviction without notice, its up to us to look out for ourselves. Corporations aren’t here to help you, they’re here to help themselves and you should do the same.